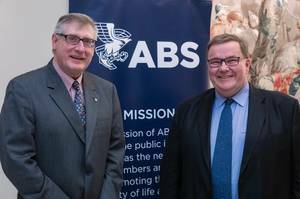 "ABS is committed to the German market and we have relocated European management to Hamburg to further enhance our deep relationships with German ship owners. This long-standing relationship means the Committee includes industry leaders that offer powerful insight on the technical and regulatory challenges facing the industry-as we harness digital technologies and innovation to meet 2030 and 2050 decarbonization objectives," said Christopher J. Wiernicki, ABS Chairman, President and CEO, who actively participated in the Committee program. "There was a high standard of dialogue amongst attendees that provided unique perspectives on issues facing shipping today," said Tom Jacob, Managing Owner from Ernst Jacob and ABS German National Committee Chairman. "Such robust conversations help guide ABS on how best to address the industry challenges we face on our journey to 2020 as well as looking farther ahead to 2050."